NRG (Maariv) April 24, 2006: Tali Fahima breaks the racist taboo on Mizrakhi peace activism. Haaretz, February 26, 2006: Hamas would like to sign a peace treaty with Israel once it withdraws from the occupied territories. Haaretz, February 23, 2006: The same, in Hebrew. ... Yasir, qui marchait a cote de moi, est soudain agresse par un policier, qui le frappe fort et sans repit tout en lui criant: <<Tu m'attaques!>> Est-ce a l'ecole de police qu'on leur enseigne cette phrase bien utile? ... L'avocat general de l'Etat s'adresse a la Cour, en deformant outrageusement les faits. ... . Je n'en crois pas mes oreilles. ... La terre en question n'est pas en Israel, elle n'appartient pas a Israel, meme dans la lecture la plus droitiere de la loi. ... Toute cette affaire est absurde. Une protestation se forme dans ma gorge, et je la retiens. <<Il n'y aura plus de manifestations a Bil'in>>, avait annonce le colonel israelien responsable du village une semain plut tot. Il se trompait. Bil'in, January 20, 2006: A large scale demonstration against the wall and the lands illegally confiscated. Haaretz, February 2, 2006: Bil'in - a light at the end of the dark tunnel of the occupation? Haaretz, February 2, 2006 (in English): Get the hell out of Bil'in. Haaretz, January 29, 2006: Boycott is ok (when initiated by Israel). Haaretz, January 27, 2006: Some call this justice! Haaretz, January 13, 2006: The IOF "searches" for the settler-terrorists! On December 28, 2005 there were 749 Palestinians in "administartive detention" in Israeli prisons: i.e., people imprisoned for an indefinite period of time without even a semblence of due process! Olive trees in the village of Burin, squeezed between the two illegal settlements Yizhar and Berakha, North-East of the illegal settlement of Ariel and South-West of Nablus. 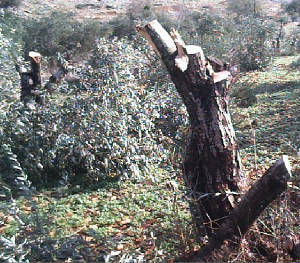 Several hundred olive trees received this treatment from Jewish illegal settlers over the last couple of days [December 16-18, 2005]. This is part of the "transfer" (ethnic cleansing) program that is being carried out under the disguise of the "peace process". Israel’s activities in Jerusalem are in violation of ... international law. ... the High Contracting Parties reaffirm(ed) the applicability of the Fourth Geneva Convention to the Occupied Palestinian Territory, including East Jerusalem, and reiterated the need for full respect for the provisions of the said Convention in that territory. ... the EU position on the legality of the separation barrier largely coincides with the ICJ Advisory Opinion. ... most new Palestinian housing is ... considered “illegal” by the Israeli authorities (although under the 4th Geneva Convention occupying powers may not extend their jurisdiction to occupied territory). Clear statements by the European Union and the Quartet that Jerusalem remains an issue for negotiation by the two sides, and that Israel should desist from all measures designed to pre-empt such negotiations, would be timely. An apartheid state on the eastern coast of the Mediterranean [December 12, 2005]. A racist state on the eastern coast of the Mediterranean [December 12, 2005]. A prominent spokesman of the zionist right admits having been a "Rhinoceros" in the case of Ms. Tali Fahima. I didn't expect this to happen that soon. לרבים וטובים, לא בהכרח שמאלנים, לא בהכרח "עיתונאים עם אג'נדה", יש תחושה קשה בנוגע לפרשת טלי פחימה. כל מי שקרא את הנימוקים, לפני חודשים רבים, להארכות המעצר עד תום ההליכים, הרגיש מאוד לא נוח. והדברים נאמרים בלשון המעטה. היה חשש, ויותר מחשש, שמדובר בהפגנת כוח מיותרת, אולי קצת דורסנית, של רשויות שונות. קראנו, חששנו ושתקנו. חשבנו שאולי יש דברים בגו. שאולי ל"גורמי הביטחון" יש מידע חסוי ומוצק, כפי שהם הרבו להדליף. חשבנו שכל מילת ביקורת תהיה עידוד לאלה שמכרו את נשמתם לשנאת ישראל. ויש כאלה. אבל כל אלה תירוצים. עסקת הטיעון שנחתמה לפני שבוע, גם היא, מגלה שלא היו דברים בגו. החששות התאמתו. גם עסקת הטיעון עצמה מדיפה ריח בעייתי. אם היה מדובר באחת מאושיות השמאל, אפילו הקיצוני, אזי על אותה שרשרת מעשים לא היה מוגש שום כתב אישום. ייתכן שלפחימה היתה מעידה, כאשר הקריאה לזביידי ולחבורתו מסמך שנפל לידיהם. אבל זהו. לא סייענית לטרור ולא בטיח. רק צעירה שמפעם בה חוש צדק מפותח. אולי קצת מוגזם. הדברים הללו הם מעט מדי ומאוחר מדי. לא אומר שאחרים התנהגו כקרנפים. אומר זאת רק על עצמי. אני קרנף, משום שהדברים היו צריכים להיכתב לפני חודשים. ואם היו מתגייסים עוד רבים ואם היה לחץ ציבורי, לא על בסיס פוליטי - שהרי אין שום צורך להזדהות עם הדעות הפוליטיות של פחימה, יהיו אשר יהיו - אז הצדק אולי היה יוצא לאור, ופחימה לחופשי. ואם פחימה בכלא, זה גם באשמת קרנפים קטנים כמוני. Haaretz, December 4, 2005 sums up the conduct of the State Prosecution and the Courts in the case of Ms. Tali Fahima: "Aggressive and arbitrary conduct"
The above, in Hebrew. The Hebrew title calls for a thorough soul-searching of the State Prosecution and of the court. Ms. Tali Fahima (left) with Adv. 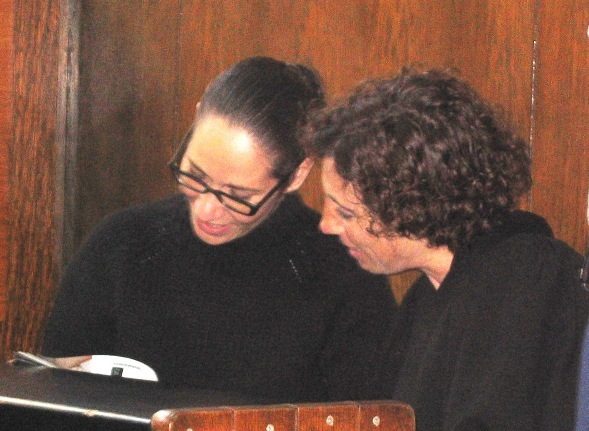 Smadar Ben-Natan in the Tel Aviv district court, November 16, 2005. The testimony of the police interrogator, Ezra, contradicted the transcript that the police itself presented to the court. Isn't it time the court puts an end to this farce? יש להכיר בכריתת עצי זית כפיגוע טרור לכל דבר ולהורות לאנשי מס רכוש לפצות לאלתר את המשפחות הנפגעות, לרבות שיערוך הנזקים לטווח הארוך והתערבות של הביטוח הלאומי. ההיסטוריה היהודית רצופה פוגרומים והתעלמות המשטרה המקומית מהמעשים ומהמבצעים ואי הבאתם לדין. הפעם מדובר במפגעים יהודים ובמדינה יהודית. המדינה מעודדת לפגיעה בחסרי ישע בהימנעותה מהפעלת החוק. על כן יש לחייבה במתן פיצוי הולם. Ynet, November 25, 2005: More occupation crimes in Bil'in, exposing the real purpose of the apartheid wall (to whoever needs more proof of its utmost criminality). Ynet, November 25, 2005 (English): "Olive trees uprooted in Palestinian village". Ynet, November 21, 2005: Does the attorney general use a fake "document" to launch an investigation of Yesh-Gvul? Interview with Adv. Michael Sfard [Haaretz, 4 Nov. 2005, in English]. After reading it you don't need to ask what I stand for. 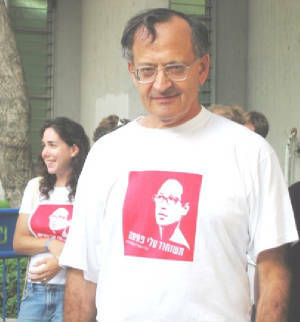 Edward Witten, signatory of the "Statement in Support of the Right to Education at Birzeit University", awarded the Technion Harvey Prize, 2005. Harold Pinter, signatory of "Jews for Justice for Palestinians", got the Nobel prize for Literature, 2005. The Guardian, October 18, 2005: "Honour leaves linguistics professor underwhelmed". The Hebrew translation was copied from the official website of the Education and Youth Corps, IOF. Ynet, December 12, 2005: A trip to Bil'in. Haaretz editorial, November 30 2005: "Who will deal with the tree destroyers?" Haaretz, November 30, 2005: The practice of deception started a long time ago. An interesting precedent, allowing the lies concerning the "lawful" acquisition of Palestinian lands to be exposed. An update on the despicable methods of the IOF in Bil'in, Haaretz, October 23, 2005. Why it is absolutely necessary for Israelis (and "Internationals") to be present in Bil'in,(Haaretz, October 23, 2005, in Hebrew; no English translation found). [Because when Palestinians demonstrate on their own, the IOF has a free hand to shot]. Does the IOF ever tell the truth? Israel hinders human rights workers in the occupied territories (haaretz , October 12, 2005). The Hebrew original specifically refers to Bil'in, where "those who attempt to protest non-violently are detained by the army". SHULAMIT ALONI, 29 July 2005. I agree with every word. Shulamit Aloni, 29 July 2005, IN ENGLISH. A very important interview.